Nobody wants a blunt blade. But traditional methods of knife sharpening can be time-consuming and require a specific set of skills. Electric knife sharpeners are safe and simple to use, can be stored easily in the average kitchen, and will get you back to slicing and dicing in no time. Minimum effort, maximum results. The good news is that they are now readily available at an affordable price, are easy to use and they act fast. Owning one will dramatically increase the lifespan of any knife, and makes it much easier and quicker to maintain your knives at home. Whether you’re a professional or an amateur, you need to consider blade maintenance in order to prolong the lives of your knives. So, rather than having to read all of the electric knife sharpener reviews out there, we’ve come up with this handy buyer’s guide to help you find the best electric knife sharpener for you. Before taking the plunge and purchasing an electric knife sharpening machine, it is essential to examine which features of this tool are most important to you. Below, we have compiled a table detailing all the necessary elements that you need to look out for. Use this table as an initial guide to help you decide which model of knife sharpener would be right for you, and to compare similar machines that are on the market. We love the Ken Onion Edition sharpener from Work Sharp. This specialist electric knife and tool sharpener machine is great for beginners and more experienced users alike. With a useful handheld design, it is maneuverable and durable enough to sharpen any blade. From grinding a dulled hunting knife back up to working order to touching up a pocket knife, and everything in between. Capable of achieving a wide range of angles between 15-30°, the WSKTS-KO boasts an easily adjustable precision sharpening guide to put you in control. If you are a regular hunter and need a knife for rougher outdoor work then a standard 20° angle will be just right. However, this fantastic tool works just as well on a 15° kitchen knife, restoring factory sharpness in minutes. Razor sharp enough to slice a tomato right in two! A variable speed motor offers the user even more control, with the ability to slow the mechanism right down for detailed work. Coupled with the choice of 5 different abrasive belts to use, this knife sharpener really is the ultimate combination of versatile and customizable. The instructions included with the Ken Onion Edition sharpener are clear and easy to follow. We recommend giving them a close read before you begin using this machine, as it can take a little bit of practice to use properly. Replacing belts for this knife sharpener can prove pricey, but in exchange, you have an enduring, high-quality tool which will prolong the lives of all your best-loved blades for years to come. Compared to other electric knife sharpeners available, this machine is such good value for money you’d be crazy to pass it by! We recommend that you take care if using this knife sharpener on smaller blades, such as pocket knives, or when sharpening to the plunge line on any knife. This is because the guide system can become an obstacle for these specific tasks. However, if you follow the instructions that are included with a purchase you will be able to achieve the desired results, even on these trickier jobs. If you’re looking for the best portable knife sharpener, the Work Sharp WSKTS-KO could well be the one for you. It can be used on a wide variety of different blades to achieve outstanding results and is a sturdy unit producing consistently good work. 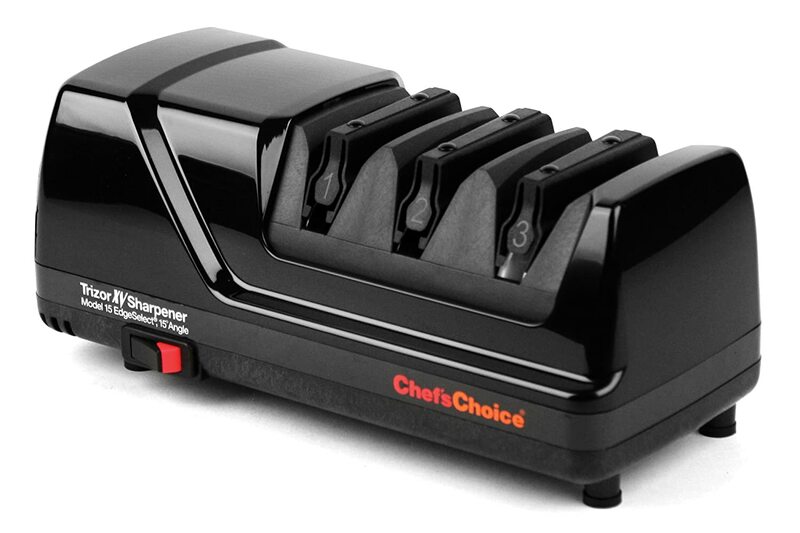 Whether you have a straight edge or serrated, a single or double bevel, this knife sharpener from Chef’s Choice does it all. Using a three-stage ‘EdgeSelect’ system, the Trizor XV is perfect for sharpening, honing and polishing any knife. With a range of 15-20°, this machine uses flexible 100% diamond abrasive disks to achieve a microscopically flawless edge on the blade. This premium quality electric knife sharpener guarantees outstanding results every time. Lightweight and portable, it can restore dull knives in seconds, or can even bring a standard 20° blade right down to a razor sharp 15° edge. Built to a high standard, it has the capacity to last you for years and to prolong the lives of your knives exponentially. Perhaps not the first choice for beginners, the Trizor XV does take some getting used to, and we recommend practicing in order to achieve the best results. However, with some application, this tool offers a fast, easy, and consistent way to sharpen knives at home. And it takes only a fraction of the effort to use that more traditional methods demand! The three-stage system incorporates a sharpening port, a port for honing, and a stropping or polishing port which utilizes flexible disks for maximum results. Made from 100% diamond abrasives, these polishing disks will create a super sharp polished edge. It is worth considering that this unit can make significant noise whilst in use, caused by the motor vibrations. It can also produce some metal dust as it sharpens the blade. These factors shouldn’t inhibit your enjoyment of the machine’s superior qualities but are worth bearing in mind when using in the home. 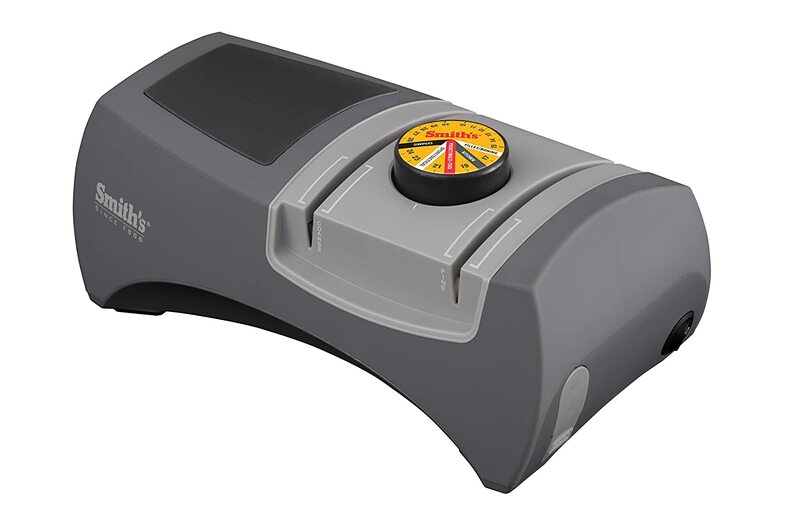 If you’re searching for a faster, easier alternative to whetstone sharpening or other traditional methods, then the Trizor XV could be the one for you. It is ideal for more experienced sharpeners who want to save time on this task, but still want to keep their knives exceptionally sharp and in pristine condition. It is also perfect for those wanting to convert 20° blades to an Asian-style 15°. Wusthof is a well-respected name in knives, and therefore you expect their prices to match their prestige. However, this affordable electric knife sharpener represents guaranteed quality for a reasonable price. 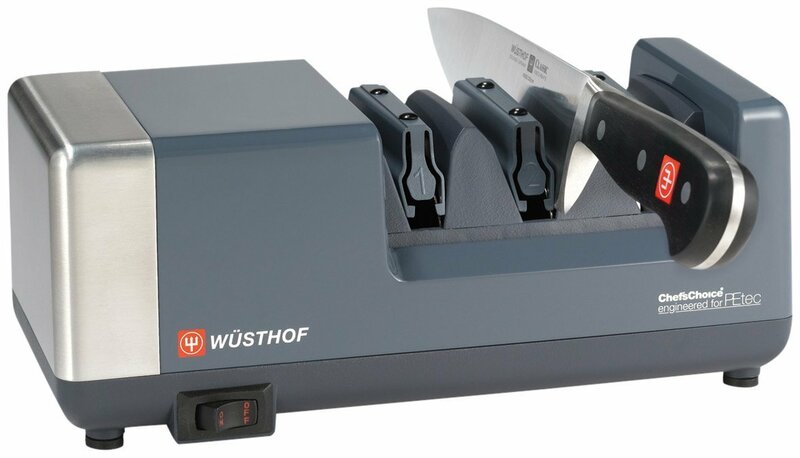 The Wusthof PEtec sharpener uses a three-stage system with diamond abrasive disks to facilitate superior sharpening, honing and polishing of any blade. Boasting a range of achievable angles from 14-30°, this sharpener only takes seconds to touch up a knife before it’s back to factory sharpness. Suitable for a wide variety of different blades, from hunting knives to kitchen boning knives, to pocket knives, it can handle knives of all sizes and uses. It can even put a new, sharper edge on blunter and thicker knives, without damaging the blade. Despite the prestige of the Wusthof name, this machine is fairly straightforward to use. We would happily recommend it to the less experienced sharpener. It contains a robust motor that won’t slow down with use and a handy magnetic insert that will collect any waste metal filings. This is a tool ready for beginners, but that doesn’t mean that you can neglect the instructions. We do recommend practicing with it first, before letting loose on your prized collection of Wusthof kitchen knives. Although the knife guide on this model is supremely accurate and will guide your hand, it is possible to cause small scratches to the blade’s surface if used incorrectly. This is a hard wearing knife sharpener with a projected long lifespan. However, the soft plastic parts, the ‘draw-through’ section, can be prone to damage if not treated with the proper care and respect. Look after this machine, and it will look after you and your knife collection for years to come. This is a great all-rounder for an electric knife sharpener. It’s simple to use, it can complete a wide range of tasks, and it comes from a trusted name. If you’re looking for a machine that can do a bit of everything, without compromise, this may be the model for you. The 130 Professional from Chef’s Choice is ideal for touching up standard 20° blades. It offers a no-fuss, straightforward approach and is suitable for both straight edge and serrated knives. The three-stage system allows you to separately sharpen, hone and polish. Using high quality 100% diamond abrasive disks in stage 1, blades can be sharpened back to working order in seconds. Stage 2 uses super hardened miniature steel to achieve a razor-sharp edge with microscopic serrations for extra bite. This non-motorized stage can be utilized as often as needed until Stage 1 sharpening is required. Stage 3 uses an ultra-fine flexible stropping disk to create a smooth edge on straight blades, but can also be used to sharpen serrated blades. Due to the shape of the serrated blade, the machine will not sharpen it completely but it will give it a new lease of life. You will really notice the difference! We recommend this product for beginners and amateurs as the instructions are easy to follow, and the angle guide will ensure an accurate 20° edge is achieved. However, it does require some skill to achieve the best results. Therefore, we would recommend reading the instructions closely and practicing first. We don’t recommend this model if you want to reduce the angle to a sharper edge on any blade. For example, a standard Asian-style kitchen knife will be 15°. The 130 Professional is best used on USA standard 20° kitchen knives or blades used for less delicate work such as hunting knives or pocket knives. 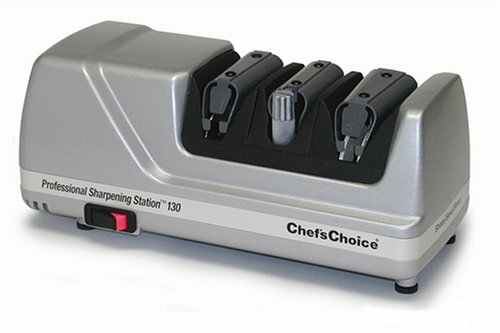 This model from Chef’s Choice is a safe and easy alternative to whetstone sharpening. It will help to maintain and prolong knives for years to come and protects the blade’s integrity as it works. If you want to invest in a machine that can handle most standard European and US blades with minimum effort, then it is worth your consideration. Smith’s label themselves as The Edge Experts, and with this electric knife sharpening machine they don’t disappoint. With a choice of either ceramic or diamond sharpening wheels, the 50281 Edge Pro offers you ultimate control and stunning results. If you’re pressed for time, this tool sharpens both sides of the blade at once. And with a range of 10-30°, it offers the widest choice of preset sharpening angles in this list. The interlocking abrasive wheels give you maximum control over the process. Use diamond for shaping a blade, and ceramic for honing, and you are guaranteed a knife better than factory sharp. We do recommend taking care when using this model, as it can overheat when used for extended periods of time. The plastic inner parts are also not as hard wearing as other examples, so it is worth treating this machine with care. However, if you treat this tool with respect it will repay you tenfold! The unique feature of the 50281 Edge Pro is the adjustable angle guide. Controlled via an easily discernible and easily operated knob in the center of the machine, the user can adjust the interlocking abrasive wheels to the desired angle. This enables ultimate control over every blade sharpened, with the guarantee that the machine is guiding your hand. This is a great choice for those wanting to sharpen a wide range of blades, with different sizes, edges, and uses. It is worth bearing in mind that we do not recommend sharpening ceramic knives with this model, as per the manufacturer’s instructions. But for other blades, whether straight edge or serrated, this is a great option. Perhaps you are new to knife sharpening? You’d like a little more control along with a little extra guidance? Then this knife sharpening machine is perfect for you. After a thorough look at the best electric knife sharpener reviews, it is clear which two models come out on top. 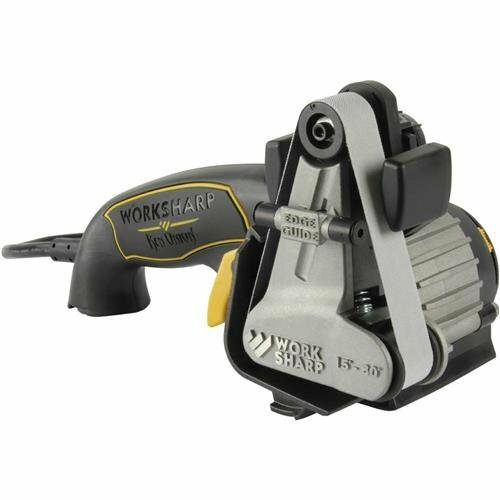 The Work Sharp WSKTS-KO Ken Onion Edition provides the perfect tool for experienced and amateur sharpeners alike. Uniquely in this list of the best electric knife sharpeners, it has a handheld design and utilizes a range of different grit number abrasive belts. The precision sharpening guide gives the user ultimate control and greatly expands the range of tasks it is capable of. The Chef’s Choice Trizor Model 15 XV offers something slightly different. Using a classic 3-stage system, with different slots for sharpening, honing and polishing, this gives the user an opportunity to fine tune any blade. With a range from 15-20°, it’s a great choice for the more discerning sharpener who is after a razor sharp edge. Depending on your own individual needs, we would highly recommend either of these models as a superior choice. Before purchasing an electric knife sharpener, there are several factors that you need to consider. This guide takes all the key points from electric knife sharpener reviews and compiles them into a handy accessible list. Whether it’s a quick touch up a job or a complete re-sharpening, you want to consider which abrasives to use. Diamond or tungsten carbide (a polished, tough ceramic) are the most common materials used in electric knife sharpeners, and the ones you want to go for. You might be the most experienced knife sharpener in the world, but you still want an angle guide on your electric knife sharpener. This tool is here to make your life easier. You want a job done quickly and properly, so go for a machine with an accurate guide. Whilst you’re thinking about angles, make sure your machine is capable of delivering the edge you need. If you’re looking for something to refresh standard European or US knives, then don’t bother with a machine that can take them down to 15°. However, if all your kitchen knives are already at Asian-style standard, you need a tool that can handle them properly. A machine capable of touch ups, complete re-sharpening, and polishing is the best value for money. It offers a wide range of uses and can be applied to a variety of different blades. Look out for machines that can handle serrated edges or scissors, if this is something you may need. Even if you are an experienced knife sharpener, you are looking for a machine that simplifies the task. If you’re a beginner or amateur, you want a model that will work with you to protect the integrity of your knives. Go for an electric sharpener that’s easy and quick to get to grips with. You are looking for a machine that will get the task done accurately but more quickly than traditional methods. Check the average sharpening time on a model before committing to it. This should be a quick and easy option, not a laborious task! Sometimes it’s worth paying a little bit extra to receive a tool with longevity. Minimal research into the trusted names in the business will help you find the best electric knife sharpener for you, and one that will last you a long time. One of the most attractive qualities of an electric knife sharpener is that it makes sharpening and using knives safer. Make sure you go for a model that will ensure your safety whilst in use and will leave blades sharp enough to use safely.